Mister Miracle was created by Jack Kirby in 1971 and was included as a part of Kirby’s Fourth World story line which was introduced in Superman’s Pal Jimmy Olsen #134 (1970). 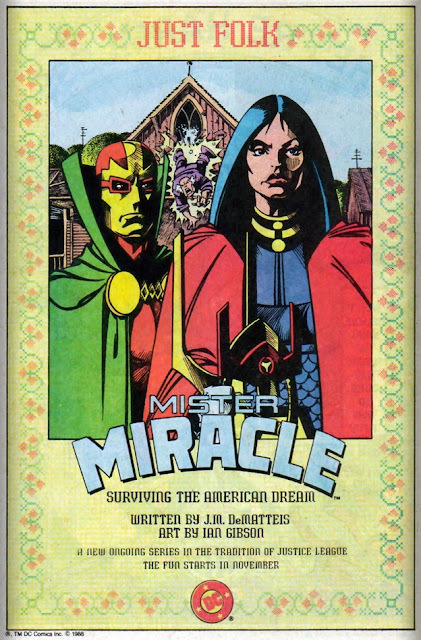 Mister Miracle’s first ongoing series lasted 18 issues from 1971 to 1974, and was then revived again for another 7 issues from 1977 to 1978. It would appear that the Fourth World interest had fizzled out by the end of the decade and Mister Miracle and the rest of the New Gods went into comic limbo after a 1980 Justice League of America appearance (issues #183 - 185). Kirby’s Fourth World characters experienced a revival in the mid-80s, thanks in part to Darkseid’s appearance in the Legion of Super-Heroes’ Great Darkness Saga story line (1982) and Kenner deciding that Darkseid and his crew would make the perfect villains for the Super Powers Collection toy line (and accompanying cartoons and comic books) in 1984. Part of the revival included a deluxe format reprint of the 1971 New Gods saga in 1984 and a Hunger Dogs graphic novel in 1985. Kirby’s Fourth World characters really hit their stride in 1986 when Darkseid was revealed to be the villain responsible for the Legends cross-over event, and it wasn’t much later that all of the New Gods became integrated into the DC universe and Mister Miracle became a member of the new Justice League (written by Kieth Giffen and J.M. DeMatties) in 1987. Coinciding with Mister Miracle joining the Justice League was a one-shot special published in 1987 reminding readers who Mister Miracle was. Mister Miracle would finally get another ongoing series in 1989 as the Fourth World’s involvement within the DC universe was at all-time high: the Cosmic Odyssey event was just wrapping up, the Forever People had just concluded a six issue mini-series, Mister Miracle and Big Barda had become prominent members of the Justice League International, Lashina (of the Female Furies) was on John Ostrander’s Suicide Squad roster, and another New Gods ongoing series was about to debut. It really was a good time to be a Fourth World character. The premise of Mister Miracle’s 1989 ongoing series was pretty simple - Mister Miracle and Big Barda want to escape all of the crazy superhero shenanigans and just settle down for a quiet ‘normal’ life in the suburbs. J.M. DeMatteis was the first writer for this series - which made sense since Mister Miracle (and Big Barda) had become a permanent fixture in DeMatteis’ Justice League International and no other writer (save for Keith Giffen) probably had a greater hand in fleshing out the character since his 1987 return. As you can suspect, the new Mister Miracle ongoing series had many humorous elements as seen in DeMatteis and Giffen’s JLI and really played up the whole 'superheroes trying to settle in a small town without drawing attention to themselves’ aspect. Len Wein became the writer after issue #8 and, while he still kept the humor, the series shifted direction and started to move toward Mister Miracle heading on an intergalactic tours sans Big Barda. I’m not sure if I mentioned that Mister Miracle and Big Barda were heavily integrated into the Justice League universe, and just to demonstrate that point, Justice League Special #1 (which occurs between issue Mister Miracle v2 #12 and Mister Miracle v2 #13) is a pivotal issue in the series and Mister Miracle subscribers would not have received it unless they had ordered it (or sought it out at the local comic book shop). 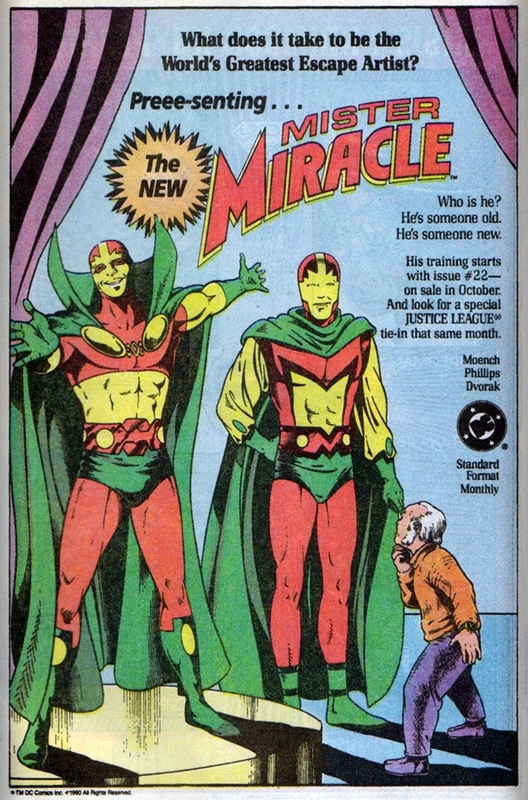 The series then focuses on Mister Miracle’s adventures across the galaxy all while a subplot about a robot Mister Miracle being introduced and killed off within the pages of Justice League America (also by Giffen and DeMatteis) ran subsequently. It should be noted that Doug Moench picked up writing chores at Mister Miracle v2 #14. The final big story arc in this series is about Mister Miracle returning to Earth, moving to Manhattan with Barda and company, deciding that he no longer wants to be a hero anymore and begins to train his old protege Shilo Norman to become the new Mister Miracle. 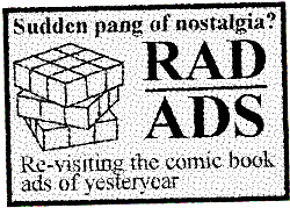 Ian Gibson illustrated the first 5 issues and was then promptly replaced by Joe Phillips who became the regular artist for the rest of the series (minus a few fill-in issues by various illustrators). If I had to describe this series to someone, I’d tell them it’s very very good with many elements of Giffen’s Justice League incorporated into it (the humor, anyways). 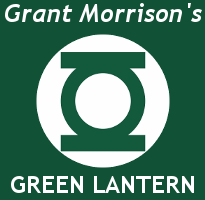 A gritty realistic mood was trending as far as comic books were concerned in the late 80s, and to have a series jump on the humor bandwagon (à la JLI) was a refreshing change. Many fans pointed out that this conflicted with the OTHER Fourth World series at the moment (The New Gods) which had a much darker tone, however this may have been done in respect to Kirby’s 1970s Mister Miracle series which also kept a light tone. Big Barda plays just as much a role in this series as Mister Miracle does, and I’m somewhat surprised she didn’t get her name included in the title. If you are a fan of Kirby’s Fourth World universe, I’d recommend checking this series out as A LOT of Fourth World characters make appearances. One of the interesting things about this series is that it picks up on a lot of the story lines and characters that appeared in the 1971 Mister Miracle series, meaning that Mister Miracle’s history/existence was NOT rebooted by the Crisis On Infinite Earths event. I guess there was no point in messing with perfection? While this series is being reviewed in a blog about DC comics from the 1980s (because the first issue was published in 1989) it really is more of a 1990s series - it even contains the obligatory Lobo cross-over (as Lobo was appearing EVERYWHERE in the early 90s). This series ended at issue #28 (1991) and Moench managed to wrap up any loose ends by the final issue (although it was revealed that he did have plans to have Barda’s new Female Furies battle her former team, but plans had to be scrapped). Mister Miracle continued making appearances in the DC Universe until he got another ongoing series in 1996. Shilo Norman (who was reintroduced in this series) also made sporadic appearances throughout the DC Universe and is still a fan-favorite to this day. This article first published in March 2014.